CCM Premier 1.9 Intermediate Goalie Pant | Sports Etc. SOLID SEAL Injection molded thigh cradle keeps the goalie square to the shooter and seal the inner pant legs to close the 5 hole. MAX COVERAGE Inner belt keeps the pant snug around the waist while the shell maintains a barrel shape and maximizes net coverage. FIT CLIP Webbing attaches pant to chest protector for a unified fluid fit. HIDDEN ZIPPER Additional 1” of length available for mid season growth spurts. KINETIC RT SYSTEM Special stretch panels designed in the pant allow maximum goalie flexibility. 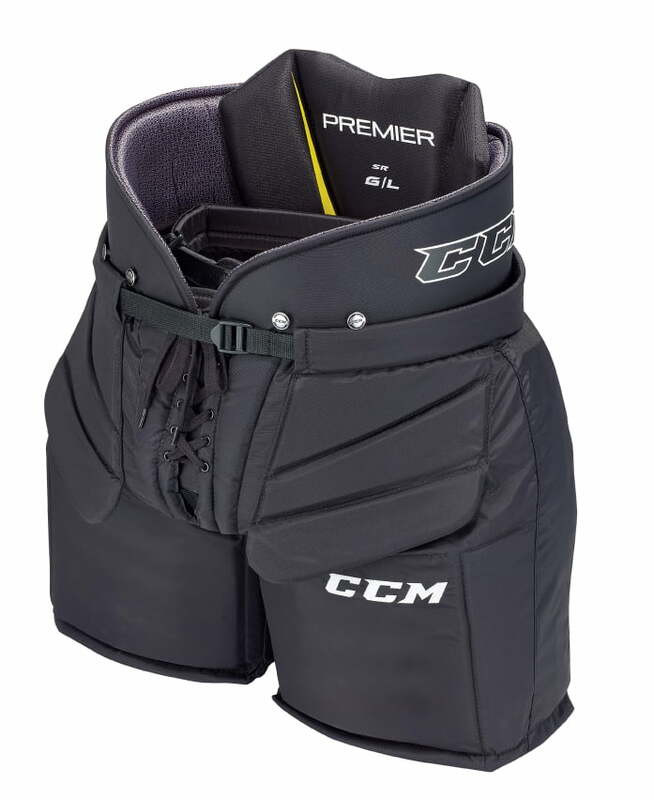 The CCM goal pant is designed with an innovative molded thigh helps close the five hole with the inner belt providing more coverage for goalies to stay square to the shooter. A new molded back waist protector will follow the contour of the goalie’s body in the crouch position maximizing protection. Simple and easy to use adjustment zipper under the belt for 1” additional length. Adjustable belt allows for a close and comfortable fit. Sports Etc Performance To Value Rating– 10 out of 10. An extremely adjustable pant with the ability to customize the length and waist size for your particular fit. Protective and affordable goal pant.